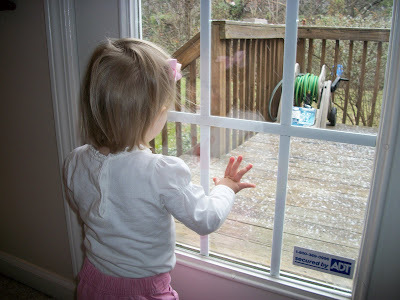 Cadence really loved watching the snow Friday the 18th. We were home all day so we got to watch it start, and build, and she kept wanting me to take her on the back deck and watch it fall. We didn't go out to play in it until Saturday and then she was not such a fan. It had kind of crusted over and it was hard for her to walk, but she liked watching the neighbor kids play in it a bit. 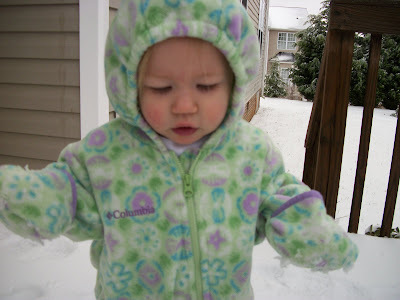 Plus, how cute is she is her little snowsuit? She is the most beautiful snow baby I have ever seen!! We can't wait to see her in a few days.